Before we even start, we need to carefully define science denialism, a subset of denialism. Generally speaking, scientific denialism is the refusal to accept well-established scientific theories, laws, consensus and facts, along with the evidence that underlies those principles. Without a doubt, calling someone a science denialist is pejorative – of course, science deniers are pushing a belief that science is wrong in contradiction to all of the evidence from expert scientists across the world. Evidence for being pro science is when you accept a scientific consensus that conflicts with your ideology. You have to demonstrate that science comes before your ideology (emphasis mine). I also want to clearly define scientific consensus – it is formed from the consensus of experts in the field based on the evidence, almost exclusively from peer-reviewed and published data. Since science is not a democracy, there is no formal vote – respected scientific societies all over the world will often publish a public statement on the scientific consensus for a particular issue. Evolution, and it’s denialist form, creationism. There are many others, but I vowed to keep my articles under 2000 words (major failure, since this one is over 3200 words). OK, maybe it’s more like a suggestion to myself. Animal testing is another one. As long as it is well-regulated, and it currently is, animal testing is one of the best ways to screen out potentially dangerous medical and pharmaceutical technologies, while also finding promising and innovating medical devices and pharmaceuticals. According to the Pew Research Center, 62% of Republicans favor it while only 42% of Democrats do. However, 93% of scientists agree with animal testing, more in line (but not close) with Republicans than with Democrats. But nuclear power and animal testing have never been subjects that I’d discuss here, so let us never speak of this again. The scientific consensus of the fact of evolution is probably one of the handful of scientific principles that approach being unassailable. The evidence supporting evolution is literally the size of a large mountain. Sometimes I’m asked to provide one single article that supports evolution, my brain freezes. I mean there’s so many, and almost all find their roots in Charles Darwin’s original ideas. It’s impossible to digest all of the scientific evidence that supports the fact of evolution, so someone asking me to over-simplify it is indicative of a lot of science denialism. People want simplicity, so invoking some imaginary deity that controls the evolution of all organisms on this planet is much easier than reading a year’s worth of scientific articles that may provide 0.1% of the evidence supporting evolution. Science is hard. Terribly hard. The old joke is that if science were easy, everyone would be doing it. About 33% of Americans believe in strict creationism, that is, all organisms were created at once and placed on earth just a few thousand years ago. But the breakdown of left vs. right is kind of amazing. The poll found that 48% of Republicans bought into this pseudoscience – actually not as bad as I would have thought. On the other hand, 27% of Democrats accept creationism. Although about half as many Democrats accept creationism compared to Republicans, it still means about one-quarter of Democrats, as a proxy for the “left”, believe in creationism. Even though you might think that 67% of Americans accept evolution, that all organisms evolved over billions of years, not all of that 67% have a scientific basis for their belief. About 40% of that group think that evolution is controlled by some supreme being (called theistic evolution, just another form of creationism). The remaining 60% (or about 32% of all Americans) accept the scientific explanation of evolution, that is, it’s a natural random process. The 2013 poll didn’t look at political breakdown for the two kinds of evolution beliefs; however, the 2009 poll (which has 32% of Americans accept creationism, so pretty close) has that breakdown. It reports that 26% of Republicans accept theistic evolution, while 22% accept scientific evolution. On the other hand, 22% of Democrats accept theistic evolution, and 36% go for science. Yes, there is a difference in the belief sets of both parties, but not quite as dramatic as one would think. One last point. Approximately 97% of scientists accept evolution as a fact – and 87% of scientists accept the the scientific consensus on the causes and mechanics of evolution, which form the theory of evolution. For those on the right that say there’s a scientific “controversy” or “debate” about evolution? There aren’t any. At least on evolution, we do have a broad right-left split on this type of science denialism politics. Using political parties as a proxy for left vs. right may not be the most accurate way of doing this type of analysis. Generally, those who speak for Democrats or Republicans, our political hierarchy, show a much clearer split – Republicans generally are against evolution and Democrats are opposed to teaching creationism in school. On this topic, the division on science denialism politics is much more clearer and profound. In a 2016 poll of Americans, about 65% of Americans believe that global warming is caused by human activities. It’s incredible that any political party would ignore the opinions of nearly two-thirds of Americans, but that’s this country’s politics. 85% of Democrats think that increased temperatures are a direct result of human activity. That’s about as close as one ever gets to unanimity in American politics. On the other hand, only 38% of Republicans agree that global warming is human related. So that answers my questioning of why Republicans would deny the scientific fact of anthropogenic climate change – their supporters are mostly deniers. I think we can conclude that there is a dramatic right vs. left split on climate change. The split does vary over time (just five years ago, almost half of the country didn’t think we should worry about it), but the last few years of warm winters has probably pushed people over to the climate change science side. Although this is probably a form of observational bias, individual warm or cold winters are not necessarily evidence of climate change, if the trends continue with warm winters, we can expect more people to jump on board. According to another Pew Research poll (wow, these guys really like polling about science, which makes me happy), over 86% of AAAS members (nearly all scientists) think that vaccines should be mandatory. That’s actually another solid “vote” for the scientific consensus on vaccines. Before I get to the general political split on vaccines, there are many of us (apparently Neil deGrasse Tyson included) think that vaccine denial is a mostly a politically left thing. 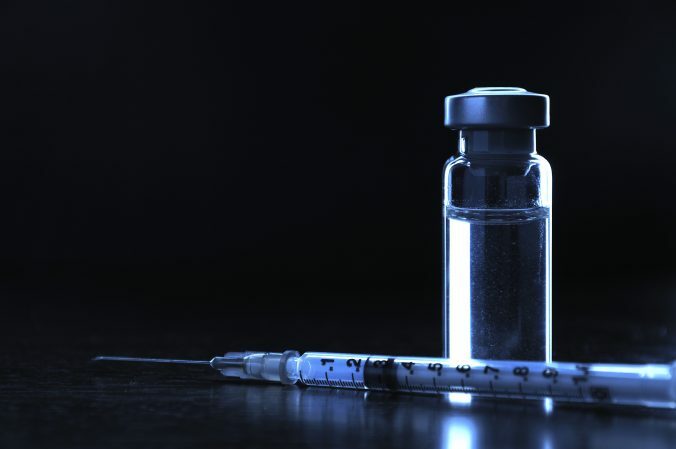 However, there’s plenty of evidence from Republican current and former presidential candidates, like Donald Trump and Rand Paul, who have publicly expressed their support of vaccine denialist politics, to show that this is a left and right wing thing. Just to show how confusing the left-right split is with respect to vaccines, President Donald Trump once met with ultra liberal Robert F Kennedy Jr. to discuss a commission to examine the safety of vaccines. I’m sure Kennedy’s father and uncle would not approve. The Green Party’s (about as far left as you can get in most countries these days) candidate for the US President in 2016, Jill Stein, is a Harvard University MD, who has practiced medicine for over 25 years. You’d expect her medical background would indicate a proclivity towards pro-science positions. I don’t know if we have an “official” stance, but I can tell you my personal stance at this point. According to the most recent review of vaccination policies across the globe, mandatory vaccination that doesn’t allow for medical exemptions is practically unheard of. In most countries, people trust their regulatory agencies and have very high rates of vaccination through voluntary programs. In the US, however, regulatory agencies are routinely packed with corporate lobbyists and CEOs. So the foxes are guarding the chicken coop as usual in the US. So who wouldn’t be skeptical? I think dropping vaccinations rates that can and must be fixed in order to get at the vaccination issue: the widespread distrust of the medical-indsutrial complex. Vaccines in general have made a huge contribution to public health. Reducing or eliminating devastating diseases like small pox and polio. In Canada, where I happen to have some numbers, hundreds of annual death from measles and whooping cough were eliminated after vaccines were introduced. Still, vaccines should be treated like any medical procedure–each one needs to be tested and regulated by parties that do not have a financial interest in them. In an age when industry lobbyists and CEOs are routinely appointed to key regulatory positions through the notorious revolving door, its no wonder many Americans don’t trust the FDA to be an unbiased source of sound advice. A Monsanto lobbyists and CEO like Michael Taylor, former high-ranking DEA official, should not decide what food is safe for you to eat. Same goes for vaccines and pharmaceuticals. I was going to edit this statement published on reddit, but it is so filled conspiracy theories and lunatic comments, I thought I’d just leave it here for everyone to read. If she only stopped at “vaccines have made a huge contribution to public health,” that would have been perfect. “Mandatory” vaccine laws always allow medical exemptions for individuals who have valid medical reasons for not being vaccinated. Moreover, mandatory vaccinations are only applied to a child who wants to go to school. Stein is simply inventing a lie, meaning the far left is as enamored with scientific untruths as all other parts of the political spectrum. Damn, I am a cynic. “Vaccines should be treated like any other medical procedure.” They are. Being ignorant about a point doesn’t make it right. Nevertheless, the actually polling on vaccines show an interesting dichotomy. Taken at the meta level, most Americans strongly support mandatory vaccinations. 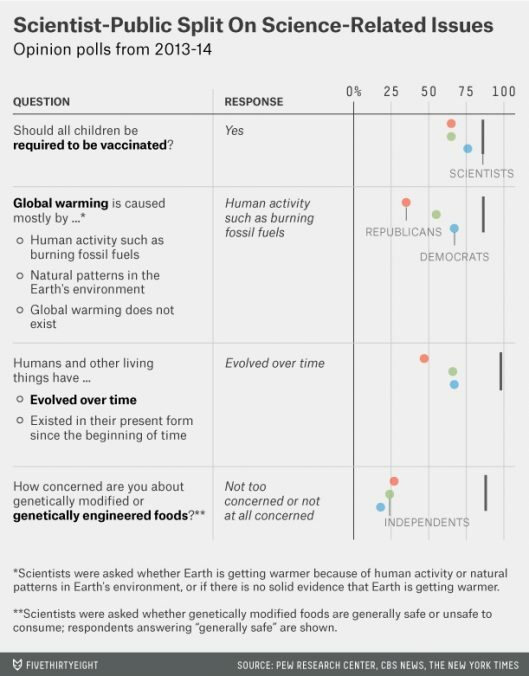 If you notice in this analysis of polling on science attitudes developed by Nate Silver’s fivethirtyeight.com, Democrats (represented by the blue dot, of course) support mandatory vaccination by around 75%, close to scientist’s 85%. Republicans and independents support mandatory vaccinations by around 60-65%, still overwhelming. I think many of us who are pro-vaccination assume, at first, that anti-vaccine was a liberal attitude. We kind of generalized anti-vaccine people to be crunchy moms buying over-priced groceries at Whole Foods. Of course, the libertarian right is also generally opposed to vaccines – which may be made up of crunchy moms buying overpriced groceries at Whole Foods, but packing a Sig-Hauer in her holster. Yes, it’s easy to create stereotypes of the anti-vaccine crowd, but that doesn’t mean they’re accurate. As I suspected, the American people are strongly in support of vaccines, especially mandatory vaccines. We should realize that the anti-vaccine crowd, whether made up of liberals and conservatives, is generally a small, but vocal, minority who hasn’t gotten much traction. Of course, repeating mistruths and lies doesn’t help. Let’s wrap up this long discourse (sorry, but so much data is available) about political attitudes and science with a look at genetically modified organisms, GMOs, a product of biotechnology. The anti-GMO forces, at least to me, are as filled with gibberish, nonsense, and logical fallacies as the anti-vaccine folks. I haven’t discovered all of the reasons why people are scared of GMOs – they fear that the genes can get into humans (no, they can’t), that nature is better (a logical fallacy), that ancient agriculture was healthier (GMOs started at the beginning of agriculture), or that GMOs cause cancer in rats (no, they don’t). There are some liberal types who conflate GMOs with Monsanto, which fails to grasp the importance of genetically modified foods to people of earth. Again, according to a Pew Research study, 88% of AAAS scientists believe that GMO foods are safe to eat, about in line with what you’d expect from a consensus opinion. On the other hand 57% of Americans think that GMO foods are unsafe to eat. What does general average American know that the scientists don’t? Did these average Americans set up massive clinical trials and have the results secretly hidden in Area 57? The AAAS scientists have come to a conclusion based on scientific evidence. The anti-GMO people have come to their conclusions based on, well, opinion? Guesses? Gut feelings? Moreover, that same survey shows that 67% of Americans have an unclear knowledge of the science of GMOs. In other words, these people are opposed to GMOs based on ignorance of the evidence. Not good for either science or trying to feed a growing planet. Referring to the chart from Nate Silver in the vaccine section, you can see that the GMO-resistance isn’t just a left-wing issue, it’s traverses to independents and Republicans. Yes, Democrats are definitely more troubled by GMOs, but relative to where the scientists sit, there’s barely a difference across the political spectrums – indeed, this is a surprising bit of data. I guess that my old trope that GMO deniers are the left’s versions of global warming deniers. Maybe all GMO deniers are just a version of the right’s global warming deniers. On most important scientific issues facing us today – evolution, climate change, GMOs and vaccines – the left and right wings vary most strongly on their positions on evolution and climate change. 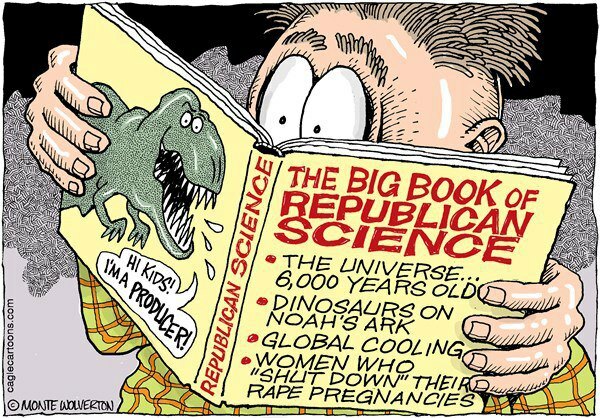 Republicans, as proxies for the right wing, are strongly opposed to the science on evolution and anthropogenic climate change, not because they have fundamental issues with the evidence, but more because that evidence undercuts some of their political foundation. That’s not science. Surprisingly, on the topic of vaccines and GMOs, there is less of a split between the left and right on science denialism politics. For vaccines, there are voices on both the left and right that are opposed to vaccinations, specifically mandatory vaccinations through the elimination of personal belief exemptions to enter public school. And public polling shows that most Americans support mandatory vaccination, with just a small difference between Republicans and Democrats in this support (thought with much higher support from Democrats). On the other hand, for GMOs, almost all Americans are opposed to GMO foods or are uninformed about the wealth of data that show that it’s safe. And even worse, the opposition is across the board from Republicans to Democrats to Independents. What does this tell me? That science has failed to communicate effectively what it is. It’s not magic. It’s evidence. And science doesn’t come to a consensus opinion without an overwhelming amount of evidence. Today, the mountain of evidence tells us that evolution is a fact, climate change is a fact, vaccine safety and effectiveness is a fact, and GMO safety is a fact. Why there should be any opposition to any of that boggles the mind, but I guess that secret research performed by those in opposition to these scientific consensuses are really good at keeping it secret. At least in America, science denialism politics seem to center around appealing to the bases of the left and right, and not to actual scientific facts. And as a passionate liberal, I am disgusted by liberal science deniers, because I expect more out of them. There, I said that. Editor’s note – this article was initially published in June 2016. It is being republished after fixing formatting issues, removing ads, fixing broken links, and updating some of the content to reflect current information.